An atom probe specimen is a small pointed tip (microtip) with a ~100nm radius of curvature. A positive voltage is applied to the specimen causing ionization of the surface atoms. Under an applied voltage pulse or laser pulse, the positive ions are “evaporated” from the surface of the sample. Time-of-flight mass spectrometry identifies individual atoms by their elements or isotopes, while point-projection microscopy identifies where atoms were originally located in the specimen. 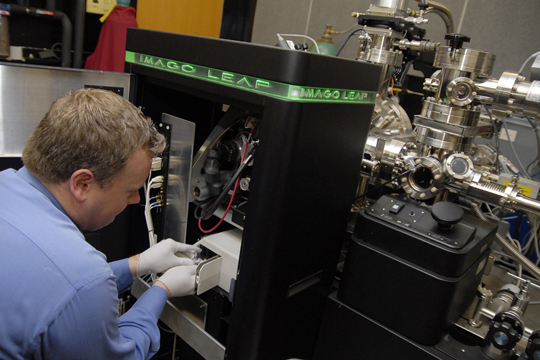 The LEAP uses the principles of both time-of-flight mass spectroscopy and point-projection microscopy to identify individual elements and to locate them within the bulk of a material and build a 3-D image of sample material.